Being inspired by Tim’s post The Road Trip and the iphone, I was happy when we had finally completed our plans for the next Road Trip. On the way to Fuji (from the Kyoto/Osaka direction) you pass by Lake Hamana, with a great roadside rest area right on the lake. This is the fun of a road trip, making stops along the way wherever something interesting catches your attention. Straight through (in good traffic averaging ~120kph) it might take 4 hours or so, but we made several stops along the way at various rest areas and sampled the local offerings (food, snacks, souvenirs), markets and parks, all in all it took us a bit over 6 hours to get to the town of Fuji and bit more to find our way towards the mountain to our (interestingly unique) resort hotel. 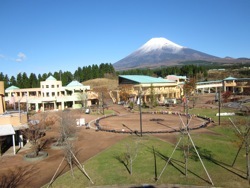 We booked our two night stay at, get this, “Children’s World” on Mount Fuji. It’s an incredibly fun place on huge site with all kinds of outdoor and indoor activities, along with a hotel, restaurant and Japanese bath for hotel guests. The hotel (Japanese style rooms) and the restaurant (Cafeteria type food) are nothing too special as such, but that simply adds to the immersion experience, you almost feel like you are camping in kid-like comfort, just the mere fact that you can stay in a place like this is incredible. Fuji Kid’s World is one of those places where you can just let you kids out to go and play… and off they go! The Japanese bath is a great place to hang out (literally) and take in the view of Mt. Fuji out the window. The big question, did we climb it? Short answer is No. Fuji is really only climbable by your average tourist in the summer time. 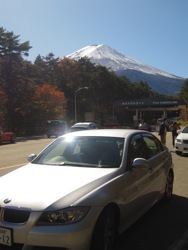 Due to snow on the mountain, we were only able to drive as far as the first station and take in the view from there. Climbing Mt. Fuji will be for another time, this time just hanging out and playing in the fields below the mountain was plenty good enough. And of course, a Road Trip does wonders for the soul, especially when the driving destination is one of the most famous mountains in the world.